This sure has been a labor of love. Our basement renovation is FINALLY underway, and phase 1 is complete! Our Movie Room is finished! It took lots of elbow grease and hard work from my hubby, along with some pretty fabulous furniture from Apt2B, but it all come together and I couldn’t love it more! 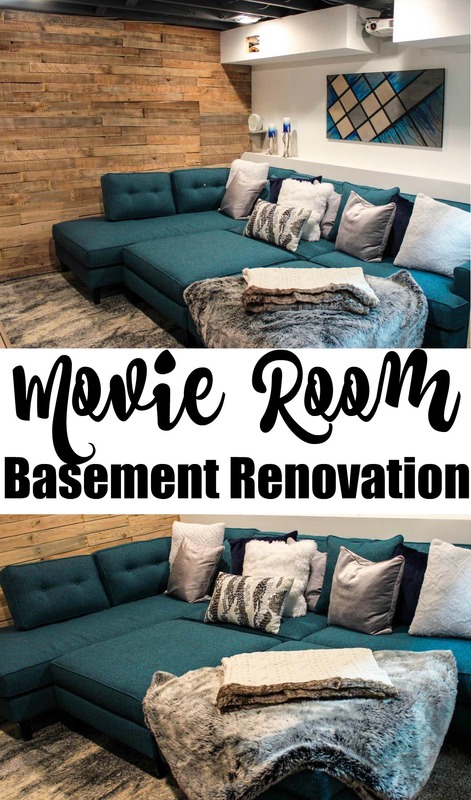 If you couldn’t give two hoots about our movie room makeover, scroll to the bottom for the $400 giveaway. Yes, that’s what our basement looked like. Poor air conditioning placement, bad wiring, and terrible lighting, just to name a few issues. So the hubbs and I sat down and started brainstorming about what we wanted to do with this little space. We both love watching movies, so a movie room was an easy conclusion. As you can see, it turned into a cozy nook that our entire family enjoys! What really got us excited about the movie room was this couch from Apt2B. If you’ve never shopped Apt2B, you are sorely missing out! 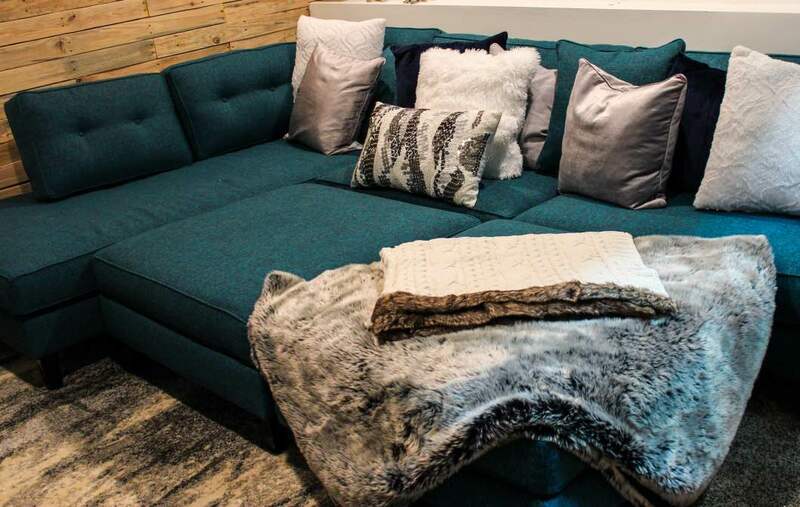 The couch is so comfortable that my husband and I have both fallen asleep on it, and the ottomans make it easy for everyone to stretch out and relax. As a mom, I also really appreciate the material, as it makes cleaning spills and stains easy and stress-free. Apt2B is made-in-the-USA homegrown fabulousness. The co-founders wanted to create simplistic yet stylish furniture pieces for any and all sized rooms. You can see from their many designs that sleek and sophisticated is the name of the game. And the best part, they’re giving away a $400 gift card! Scroll down to enter and good luck to all!! I LOVE your candle holders, and that couch looks so comfy and cozy! The perfect place to watch movies! It looks great! I love the color of the couch and the wood wall! Looks like you did a fabulous job renovating! Wow – congrats on this major renovation! It really is a big job, huh? 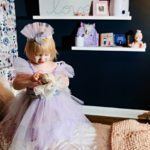 Your couch looks so super cozy and I am dying over the color of it! The simplistic yet stylish nature of the Apt2B is fabulous!! Totally checking them out. I love your new movie room, especially that couch. I’m a huge fan of furniture with color. It adds something to a room. What an awesome renovation! 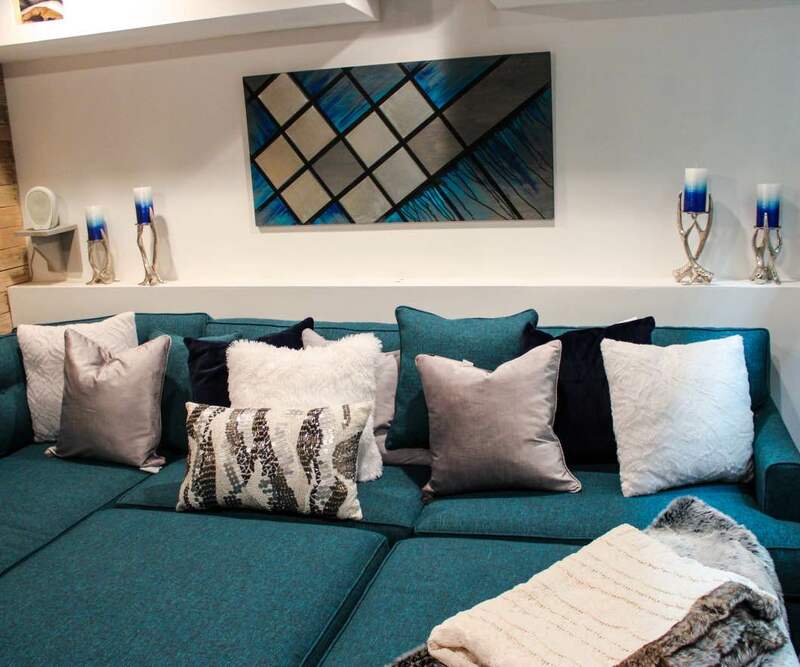 I love the color of the couch and the accessories-the pillows look awesome! I love those blankets and pillows! They look fancy, yet comfy and cozy! Oh my gosh, WOW! That turned out beautiful. Would have never thought it was a basement unless you said it. Loved your choices of colors, textiles, and accessories! amazing! I’ve been a fan of yours for a while- I actually have an Apt2B sofa too that I got a few years ago. It has studs on the arms so it’s a different style than this one but got wonderful service from them. We all love it! congrats on the new space. Wow!! It all looks so great! We’re about to move and most of the places we’ve looked at have unfinished basements. I’d love to do it up myself! LOVE!!! That is a gorgeous transformation. 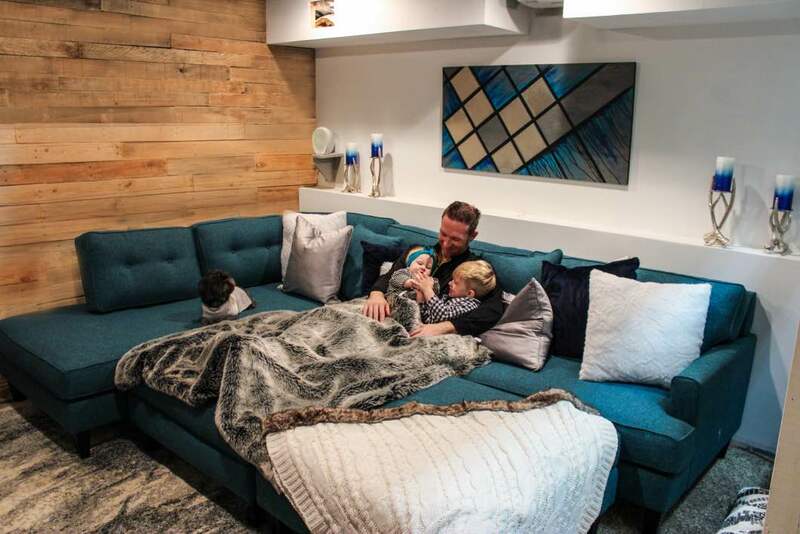 I love the cozy look and the way your family seems to be enjoying it! Your renovation came out amazing! I really like the color of your couch. It all looks so comfy and relaxing. I love sectionals. They are so comfy for a whole family to lounge and watch movies. The furniture is really cool. What a great couch, I totally want one, it would be so great in a theater room!! I also love the colors! Aw wish I lived in the US as this is an amazing giveaway. 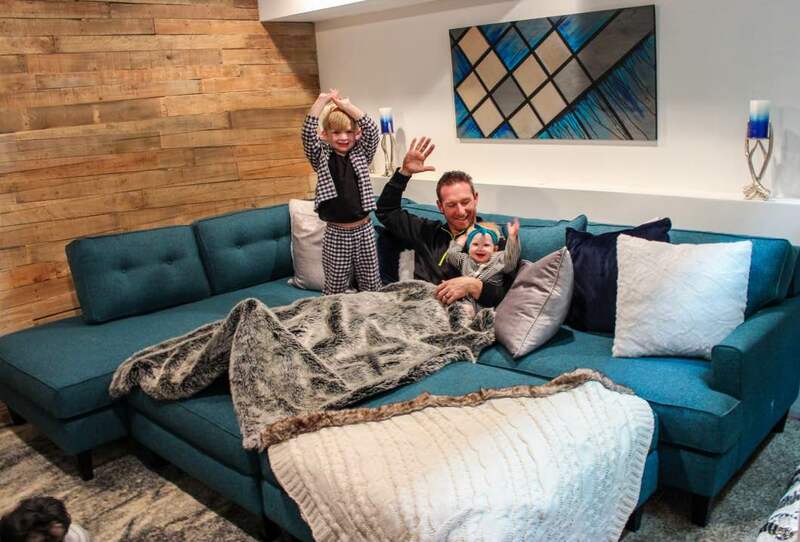 Such a gorgeous transformation and it is now perfect for the whole family to chill in. Don’t mind me while I just sit over here OBSESSING over your couch! The color, the size…it’s basically just perfection! 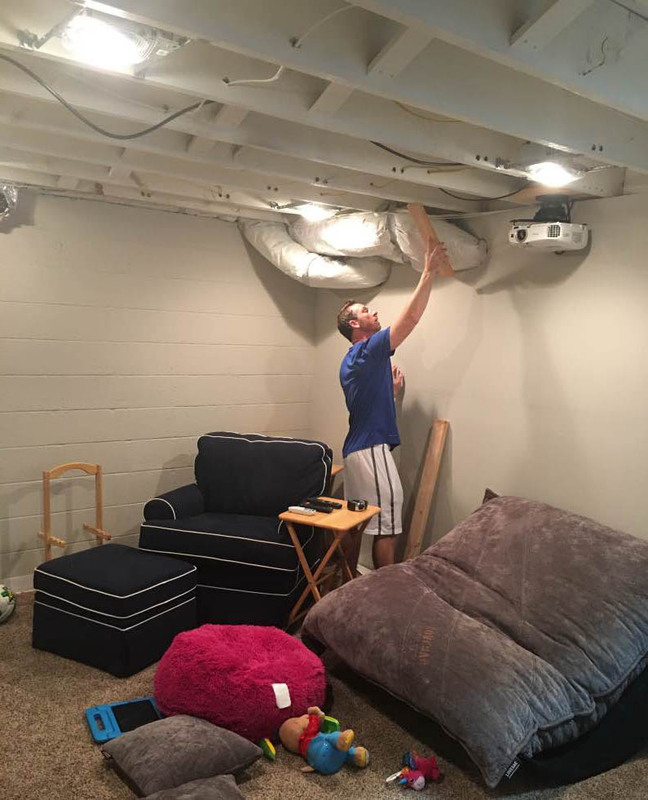 Your basement renovation looks amazing! I really love the colors — blue and brown is not a combination you see together much, but it looks great here. Great work! Nice space. Good family time spot. Can I come over? It looks nice and I love the way you decorated it. Thank you kindly for the opportunity! Have a wonderful day!! I love these products ! Thanks So Very Much for this Amazing Apt 2 B Giveaway, I Really Appreciate it! I Could Really Use this b/c I Have Been Trying to Redecorate My Bedroom but I’m Short on Funds b/c I’m Not Currently Working! I Was in a Bad Motorcycle Accident and I Hurt My Neck & Back So I Can’t Currently Work So it Would Be Such a Blessing to Win and It Would BE the Best Christmas Present Ever! 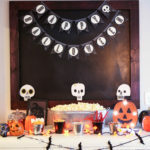 I Love Apt2B Too, I Have a Ton of Their Stuff Saved to My Pinterest Board So if I Could Actually Purchase Some of Those Things Would Be a Dream! Well Thanks Again for the Chance, Have a Blessed Day & a Very Happy Holidays! I love it! Its a cute room and I love the different shades of blue great job! I am basically going to need that couch. That is MY signature shade. It looks so cozy too! That couch/pillows/blanket are perfect! I love this whole setup! I would love to take my computer and write from that couch! It turned out amazing!! Love the colors you used and that couch is stunning!! That looks pretty cool. I love the choice of colors. If I had a movie room in my basement, I would want it made up similarly. Wow! That couch thing looks awesome! I’m sure it will be a great place for the whole family to hang out. You really did a great number down there, it looks amazing! And I love the choice of color. Wow what an awesome renovation!!!!!!! I am loving the whole look and feel! I have never seen a couch that color before! It’s so beautiful! Wow! I love the decor and the color palette. I love how you mix the textures of the couch and the accesories, the candles. Simply stunning. I really love this bright blue color you chose. 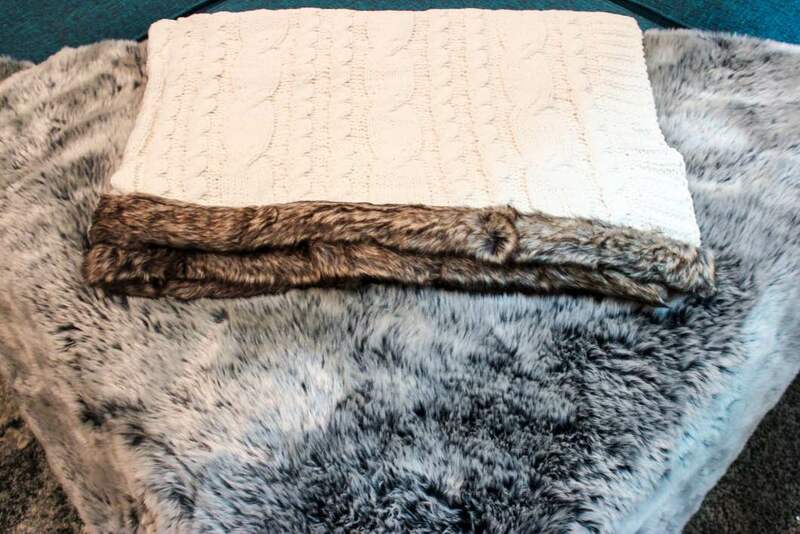 It brightens up the whole room and the textures of the gray and fur pillows are so luxurious. Looks SO awesome! I love redecorating. I think it is so neat to see a room look completely transformed from what it was before. I wish I could see a before! Love this room! It looks amazing and that sofa looks so comfy! What a great renovation! 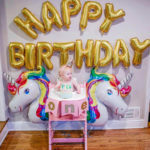 Omg just loving everything you have done with the room!!!! That blanket looks so cosy too!!! I need a blanket like that! I am lovin’ the color of the new seating. I think it really adds a certain level of coziness to the room. Love the wood accent wall! I love the way your movie room turned out. The colors are so vibrant and I am sure your family will make a lot of wonderful memories there. I love how the renovation turned out! 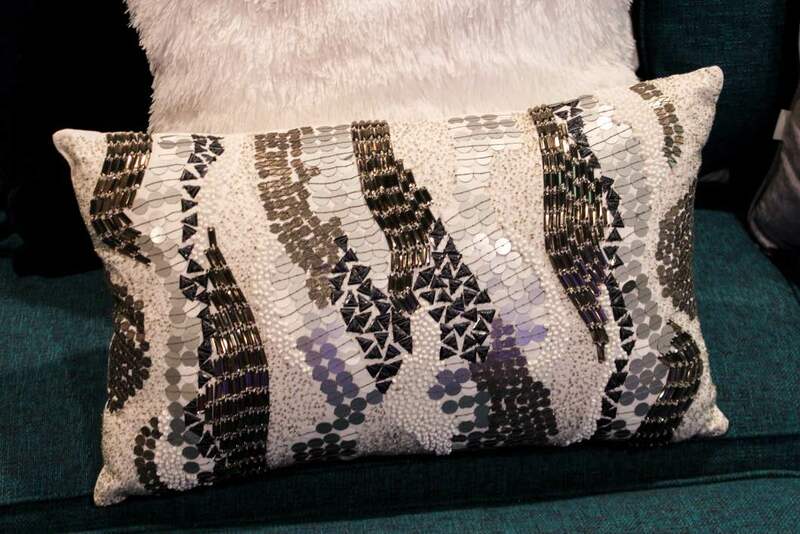 The pop of color in your couch is just amazing! I would love to have a movie room as well someday! We don’t have a basement where we live, in new mexico, its pretty rare to have one. 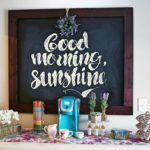 Although if we did, my husband would be all over this DIY guide! Nicely done! It looks amazing and your hubby looks just as excited as your kids haha! Wow, you totally transformed this space. That furniture sure does look cozy – perfect for watching movies on. Such a beautiful make over! Looks like you and your family will be spending a lot of quality time together in there! What an amazing makeover! I love the couch so much & looks so comfortable and I LOVE what you did with that wall! What a gorgeous and cozy space! I love everything about it. 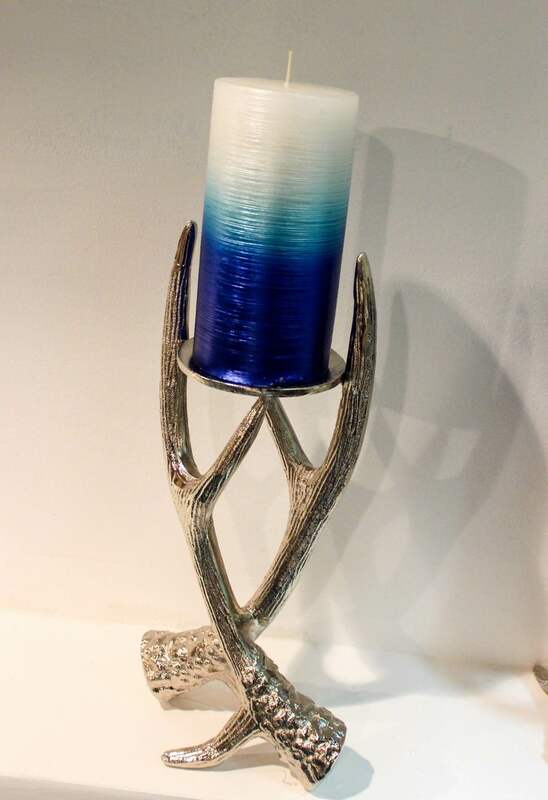 the colours are my favourite too… I really love the candle holders they are really neat! Thank you so much I have been emailing you back to try to figure out how to get my prize..can you please email me back ty again. I’d love to have a movie room. I think it would turn into a man cave though. My husband loves movies and video games. I never have the time to watch an entire movie. I would love a basement in my house for this exact reason. I love how you’ve decorated the place, the introcya details really help. It looks so snug! My husband and I are about to move into a new house soon. One of the things we’re all hoping to find is a huge basement so we can turn it into a nice movie room like this! Oh my goodness I would love to have a movie room. 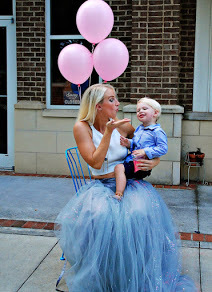 It looks fun and I love the colors! the basement reno looks amazing but that coach!!! You can add the whole family and more and it’s clean lines really keep it simple but elegant for a basement. LOVE IT! YES to this basement renovation! I love the outcome and that sofa is to die for, it’s perfect for the movie room. It’s cozy and the color is warm on the eyes. Good job on renovating your basement! Oh to have a dry basement! Our house was built circa 1880’s and there is no way I could finish a room down there. But this, this is what I want! I love the color of that couch, seriously amazing. Wow this room turned out amazing! I am loving the colors of the room especially that couch! This room looks so comfy and cute! I love the contrast of the blue pillows against the wall color. How cool is this! We love your sofa… or as we call it, couch bed. The color is vibrant and cool and it looks comfy to snuggle up and watch a movie marathon. Congrats on the renovation! Wow that is one gorgeous basement. I love the colors you chose. It looks so comfy. Hope you make lots of beautiful memories there.